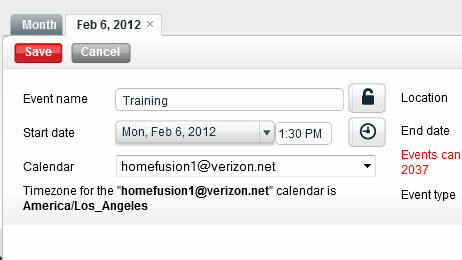 Navigate to the LTE Internet (Installed) (HomeFusion) Email homepage, enter the username and password then click Sign In. From the Calendars tab, click Create Calendar(s). Enter the appropriate information then click Create (upper-left corner). From the Calendars tab, Click Create Event. If necessary, click the calendar to locate the event. To import events, refer to Import Events. Enter the appropriate information then click Save (upper-left corner). To edit or delete, place the cursor on the event.